10w0d: Hit the double digit week mark! Kumquats For All! Absolutely beautiful day outside which mirrored the spirits of our joy for today's milestone. Remember, it's one day at a time. In honor of today's big day, the wife gave me this awesome pin that symbolizes the actual feet of our baby at 10 weeks. It is at 10 weeks that a baby is now perfectly formed, right down to his toes. All that is needed now is time for him to grow. Our unborn child cannot speak for himself, so I am speaking on his behalf. Very special keepsake indeed. Our kid continues to grow at warp speed gaining around half an inch in the last week alone! He is now the size of a kumquat, or about a little over an inch long. He weighs less than a quarter of an ounce. He has reached a very important developmental milestone as it's the offical beginning of the fetal period in which his organs will now mature at a very rapid pace. Starting today, his kidneys, liver, heart, and intestines are forming tissue. His toenails and hair are beginning to grow. All of the baby's limbs are now flexing. His wrists are now fully bending and hands can meet over his heart. His legs are now long enough to meet in front of his body. In fact, today and through the next week, he will start swallowing and kicking around. The peach-fuzz hair is now growing all over his skin as a protection to his largest organ - the skin. His bone and cartilage is starting to form. His vital organs are now beginning to rev up and start working on their own. While his legs are not working yet, his arm joints are in full work mode. His body length will double in the next three weeks. All in all, the baby TODAY has completed the most critical portion of his development! 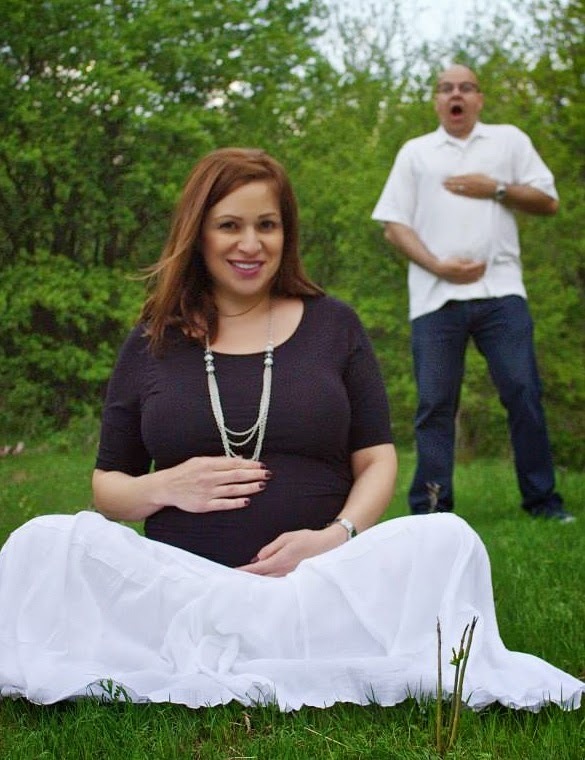 Her uterus is now the size of a grapefruit. In comparison, just two months ago, it was the size of a pear. Her fatigue continues, including the infamous cravings. She continues staying hydrated with lotsa water. I send her to work with loads of fruit, including her favorite cut-up cucumbers with lemon. She continues to need lotsa water that is drawn into the bloodstream quickly. At the Doc this week, they pulled 5 vials of blood. Yikes!!! Her visible veins in her chest are a result of the extra blood required to nourish the demanding baby. Her breakouts in her face are also a result of the pregnancy hormones wreaking havoc on her body. This is quite something isn't it? It's fascinating to see what is happening day by day. In fact, the baby's forehead is bulging because of the rapidly developing brain and its sitting high on his head. The baby's liver is now producing blood cells, which means that the yolk sac is no longer needed. 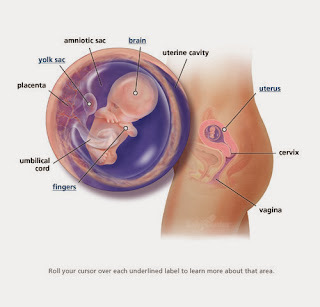 Up until today the yolk sac was the primary and most critical nutrition vessel to his body. It will now begin disappearing. If you notice his hands, the fingers are now completely separated and no longer webbed. The fingernails are now coming out too. Oh, taking a big sigh of relief and thanking the heavens for this experience. It's exhilarating, yet nerve-wrecking all at once. For now, I must leave and give my lady a big barrel-full-of-kumquats-sized hug! 10 WEEKS under our belt!